The rock-crystal hoops of the bracelets (ca. 330-300 B.C.) have been carefully cut, carved, and polished to produce a twisted appearance, highlighted by wire bindings fitted into the valleys. 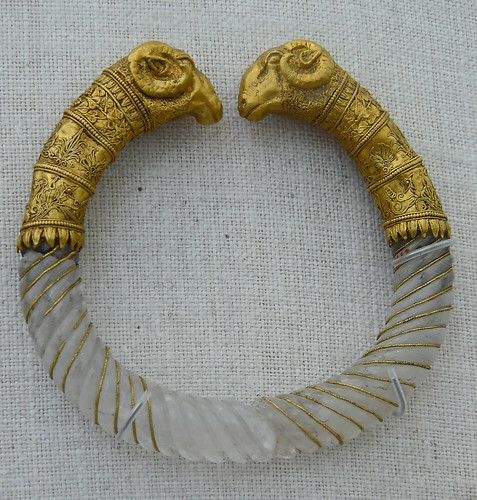 The rams' heads emerge from long elaborate collars decorated with three friezes enclosed within bands of darts and bordered by plain beaded wire. The upper frieze, an ivy chain on a vine, is tied at the center with a Herakles knot and bears four bunches of grapes; the middle frieze has palmettes with pointed leaves; the third frieze, a palmette complex." For more images and information, please click ganymede jewelry. I am just about to finish The Golden Mean and I read that you may do a sequel from the point of view of Little Pythias. I know you're not planning to finish this for years but I am already anticipating getting a first glimpse. I LOVE The Golden Mean, am waiting to read the last few pages because I don't want it to end. Please write the sequel!!! I know lots of other people would love to read it too! The harsh light of the classical world is prone to bleach away all humanity and leave only the bare outline of myth. Not so in Annabel Lyon's The Golden Mean, in which Aristotle is haunted by agonies of the flesh and spirit, and Alexander, his most famous pupil, struggles to be Olympian despite a murderous nature and merely human powers. We witness their brilliance emerging through their pain and ignorance. Few writers would dare to employ Aristotle as their narrator but Annabel Lyon has done exactly this in her extraodinary novel The Golden Mean. In thoughtful and controlled prose that never fails to grip, Lyon presents an unexpected portrait of the young Alexander the Great, a fascinating recreation of Plato's Academy and brings the ancient world back to life with a splendour I haven't seen since I, Claudius. A triumph of erudition and story-telling. Lyon's singular gifts for description, character development, and plotting are on full display here, informing her unique and creative story. The novel is deep and rich in thought and accomplishment, yet it reads with the calming ease and influence of a cool summer breeze. I absolutely loved The Golden Mean. Annabel Lyon brings the philosophers and warriors, artists and whores, princes and slaves of ancient Macedonia alive, with warmth, wit and poignancy. Impeccably researched and brilliantly told, this novel is utterly convincing. The Golden Mean, so full of intellect, is a pleasure to read. If excellence is our standard, then this novel will certainly flourish. An exhilarating book, both brilliant and profound. Annabel Lyon’s spare, fluid, utterly convincing prose pulls us headlong into Aristotle’s original mind. Only Lyon’s great-hearted intelligence could have imagined and achieved the brave ambition of this book. Vital, ferocious and true, The Golden Mean is an oracular vision of the past made present. In Lyon’s clever hands, more than two thousand years of difference are made to disappear and Aristotle feels as real and accessible as the man next door. With this powerful, readable act of the imagination, Annabel Lyon proves that she can go anywhere it pleases her to go. "Being underestimated…is something most women have in common." Mary Renault on "Lost Booker" Longlist!